Ok, I could go on about how some men are awful and the music industry is stuck in the past along with the rest of the world but I want to focus on something else. These kinds of reactions to us calling out offensive comments, taking up space or just being ourselves are what women musicians have to deal with throughout their career. I mean PJ Harvey still has to deal with crappy sexist comments and she’s been in the biz for decades. How do we learn to recognise them for what they are, battle through them and, most importantly, put the naysayers in their place? Yeah … that doesn’t matter. What matters is what you say and do, not what you’ve collected around yourself to create the false perception of sainthood. I seriously grow tired of the folk that claim to be progressive but are actually either deeply prejudiced or like to sit on the sidelines as long as they’re ok (I’m not sure which I despise most). But I digress. For me, to recognise prejudiced comments I needed to have the strength and belief in my own creative powers so I didn’t give up. Looking back to our sisters and foremothers who paved the way is a great way to get your head back in the game. The beauty that was created in the face of defiance is always something to behold and to be inspired by. Having a belief in what can be achieved and a vision of what you are is your armour in what can sometimes feel like an uphill battle. The creativity of female artists is not what is even being judged here. It is presence of the feminine in what generations of men have tried to determine as a masculine field that allows the occasional woman in. An in depth look at the history of most music genres shows that the presence of the feminine and masculine can be found and works well. It is only when the history books are published, records sifted through and decisions made on who to interview in this month’s NME that the masculine aspect as music becomes more prominent. 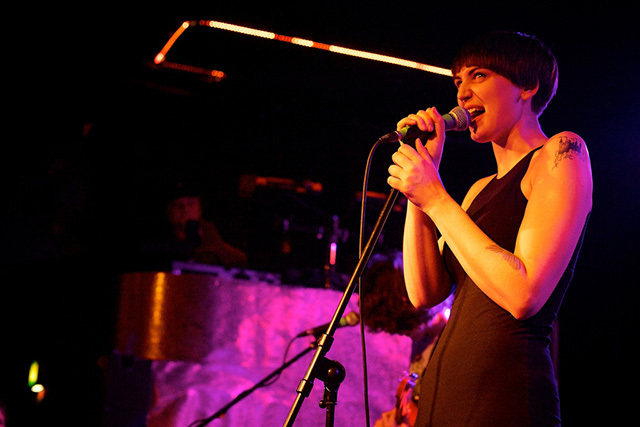 Joanna Gruesome’s singer Alanna McArdle at the microphone during a performance at The Lexington in January 2014. Image courtesy of Paul Hudson, shared under a Creative Commons License.